While FIFA seems to be grabbing the spotlight these days, let's not forget that Konami's Pro Evolution Soccer has been quietly progressing on the sidelines into a solid soccer franchise. 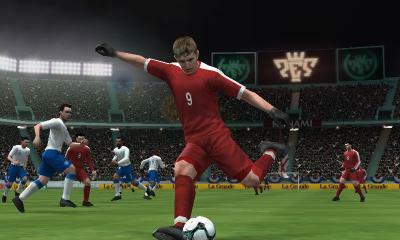 As the only soccer title available on Nintendo's new hardware there's no FIFA to compare it to, but based on its own merits PES 2011 3D has enough fancy footwork to kick this one straight between the goalposts. 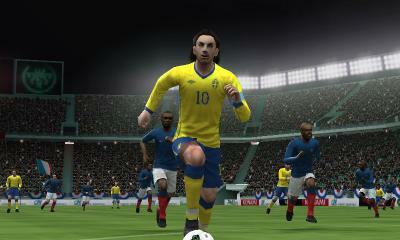 If there is one launch title that serves as a showcase for the Nintendo 3DS capabilities, PES 2011 3D would be it. While the gameplay basics feel like they haven't changed much since the PS2 era, it's really the eye-popping 3D graphics that sets this game apart. For the first time ever in a soccer game you can see field depth during gameplay, which greatly enhances the ability to spot the distance between players and the net. The default 'Player' view is from a top-down over-the-shoulder perspective which technically looks impressive as you gaze across the entire pitch and feel a real sense of 3-dimensional space. With the 3D slider flipped up to the max the depth is eye-popping as each pass, through-ball and shot sends the soccer ball deep into real, palpable space. Controls are pretty simple and feel similar to those found in the recent PSP outings. That means some of the refinements found on the console versions have been lost -- such as 360 degree Total Control passing -- but overall the game is extremely playable. Player movement is done with the circle pad or D-pad, kicking and passing is done with the four face buttons, and you can perform tricks or speed boosts using the shoulder buttons. The lower touch-screen is used to display the field radar and you can also assign defensive and offensive tactics with hotkeys with can be employed mid-game by tapping on them. It's an elegant and intuitive layout, my only complaint is that when the action heats up it can be a little far to have to look down at the lower radar given the "black space" between the two screens. While the main modes in PES 2011 3D are deep and rewarding, there just aren't enough of them when you compare this version to past iterations. Included in the game are the UEFA Champions League﻿﻿ and Master League game modes, which are deep and rewarding on their own merits, but gone is the popular Become a Legend﻿ mode. Oddly enough there's also no training mode which is surprising given the game is targeted at the more casual audience of the 3DS and also given how complex some of trick shots are to perform. The lack of online multiplayer functionality is even more disappointing, but at least you can go head-to-head over local wireless (there's no download play so two game cartridges are required). Despite the lack of modes and online features what's included is pretty solid. For a handheld game the graphics are surprisingly good and 3D visuals offers a pretty compelling reason to check out the game. 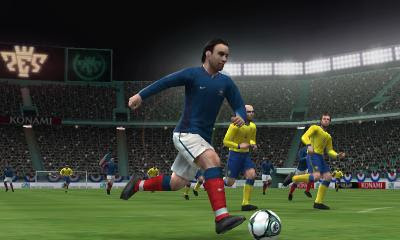 We'll have to wait another few months to see if FIFA will step it up come this fall, but in the meantime you can't go wrong with PES 2011 3D.